There’s a story about when the British colonised India (for good or bad.) They were in Calcutta and some of the English people were trying to establish a Golf Course. 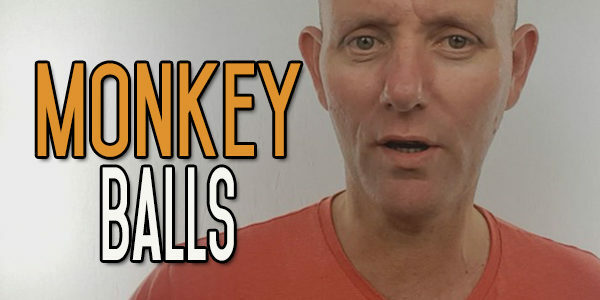 The first thing that they did to try and control this situation was to build high fences around the Golf Course – not such a great idea considering it’s was Monkeys that they were trying to keep out! Not surprisingly – the Monkeys just climbed the fences and carried on with their game. The next thing they tried to do was to lure the monkeys away from the Golf Course. I don’t know what they did – maybe they shook bananas at the monkeys – but when they were shaking the bananas at some of the Monkey’s, the rest of them just ignored the lures. And so, it continued – some of the Monkeys went after the lures and the rest ignored them. The reason I’m telling you this story is because sometimes life is easy. Sometimes you just get up, get on with your day and everything falls into place the way you want it to. Other times, no matter what you do, things go wrong. Things that were always going to go wrong, no matter what you did, things that are out of your control. We’re full of habits, always doing the same old things. We get into a rut of doing the same things all the time and in order for any change to happen in your life, you’ve got to push yourself outside of your comfort zone. By nature we are pleasure orientated beings, who want to get as much pleasure out of life as we can and avoid as much pain as possible. But you’ve got to give up that pleasure – and push yourself outside of your Comfort Zone. You need to give yourself a little bit of pain and short term discomfort – in order to get the long term results. I think one of the things that we need in our lives is not so much pleasure, as meaning. There’s a lot to be said for having some pleasure in your life, it’s nice to have pleasure, but pleasure is short lived. Meaning gives us something that is a lot more durable and something that adds to us as people – and in my opinion – keeps us away from alcohol, drugs and nasty behaviours. Things that are detrimental to you in the long run. Once you decide to start and push yourself outside of your comfort zone, there are always going to be variables that you didn’t count on, variables that you didn’t know existed. Things are going to happen that you will just have to go along with. You will have to just play the ball where the Monkey drops it. A big part of quitting alcohol is about experimenting with new things. We’ve been drinkers for so many years that we’ve been stuck doing this one thing leading our alcohol life to expand – instead of what should have expanded – which is our Comfort zone. That alcohol life has expanded to encompass a lot of what used to be our pleasures and our lives have become more constricted. So, in order to push yourself outside of that, you have to do things that you wouldn’t normally do and that takes a lot of experimentation. With experimentation you need to step in a little bit, try something new and then step out again and just see how it feels; just see what the reaction is; see what happened. Then step in a little further and try something a little bit more and then step back out again and just see how these things are moving on; see how you’re getting along. A good example of this is trying to create a new interest for yourself. You can do this from the safety of your own home, by joining online groups and forums that either through or outside of Facebook. You can then watch and read the posts to get a feel for the place and then tentatively ask your first question or make a first post. Then step back a little bit and see what the reaction is, see how other people are responding to what you are saying. If you like what you see and what you’re reading, then you can take another step forward and make another post or if you don’t like what you’re seeing you can step back altogether and go somewhere else. So always try to experiment a little bit and see what way things are going to pan out for you. See where the monkey drops the ball and then play from there. Since the day, we were born, there have been many different factors in our life that are just outside of our control. For example: Where you were born, who your Parents were, who your Brothers and Sisters were and where you went to school. These all started with one circumstance which then lead on to another, and another. The place you were born was probably one of the biggest places were the monkey dropped the ball. The same with who your Parents are. They met wherever they met, it just happened that they were together in the same place at the same time, they got together and then they created you and that’s where the monkey dropped the ball and onwards and backwards and backwards, it goes. And it’s the same thing with life, you are where you are, you went to the College where you went to – or you didn’t go to College, like in my case – because of where the monkey dropped the ball. It’s a variable that is outside of your controland once things are out of your control, all you can do is go with the flow. The biggest thing about this, the biggest lesson you can take from this is your response. It’s how you respond to things and some things are just going to happen. Some things are just going to take place. How you respond is everything, it’s everything that matters anyway, because those events are going to happen regardless and your response whether you make this decision or that decision or make no decision – it’s still a decision, it is still a response. So how are you going to respond? That it’s for today. I hope you enjoyed this video, if you did give us a thumbs up, if you would like to support the show then you can come over to http://www.patreon.com/alcoholmastery and you can become a patron of the show, for as little as two dollars a month. I think that’s what it is – half the cost of half a beer or something like that. If you do this, I’d very much appreciate it. "By making the best of all things, we are making the most of ourselves"
What a brilliant lesson Kevin. A great philosophy for life. Thanks for this. PS, is this on YouTube? Glad you liked it Martin. Yes it is on YouTube. Hi Keven, great video, a very helpful story to have in your head in times where you need to give yourself a lift. Brilliant.